Barley grass is the young, leafy growth of barley and is considered the first cereal grain cultivated by humans. Since the early twentieth century it has been used as a high-nutrition food thanks to the broad range of vitamins and minerals it provides. Barley grass powder is produced with minimal processing. It is grown until the young leaves of the plant are in their most nutritionally rich and fertile phase. It is then harvested, cleaned, dried and milled into a fine powder. Barley grass is high in Vitamin C, which helps maintain cardiovascular health and contributes to energy and vitality. Organic Barley grass powder from China. Take 2-3 teaspoons per day, mixed with water or a smoothie. Alternatively, sprinkle on or add to food. Start with a smaller serving and increase gradually. 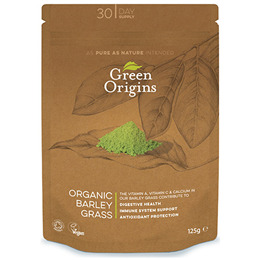 Below are reviews of Green Origins Organic Barley Grass Powder - 125g by bodykind customers. If you have tried this product we'd love to hear what you think so please leave a review.